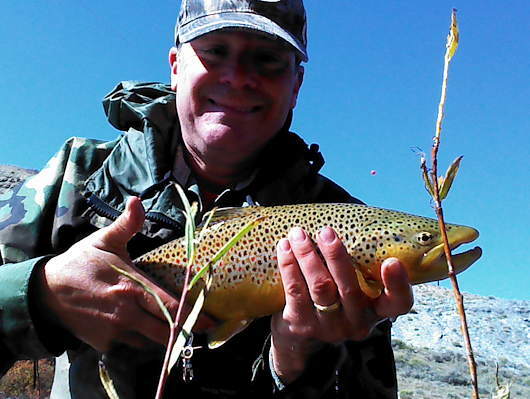 Gil Coleman with Brown Trout. This recently added trip to the Frying Pan River near Glenwood Springs. Host: Ben Zomer. Ben has a rental cabin on hold just across the street from the river! I’m guessing if you are interested and would like to stay at the cabin, please let me know not later than Sept 18th. Contact Ben Zomer. Join a gang to fish the Poudre in several stretches between M.P. 84 (Hatchery) and M.P. 79 (Sleeping Elephant). This is a good trip for new and other anglers trying to learn about more good river spots, or for others who haven’t yet ventured beyond the canyon’s lower or middle stretches. Hosted by Dennis Cook. October 8: Board Meeting at 7:00 PM. Members are welcome to attend any board meeting. Check with a Board Member to find out where the meeting is being held. Please join Odell Brewing and Rocky Mountain Flycasters for an evening presentation of the PatagoniaTM film DAMNATION. Stunning cinematography highlights this compelling look at the ecological benefits gained from the removal of obsolete dams. Doors open at 7 p.m. Admission ($10.00) covers the movie, one Odell beer and snacks. 5.00 for additional beers. Gear and swag to be raffled off. All proceeds benefit Rocky Mountain Flycasters, a 501c3 charitable organization. Chris Kennedy will speak on the history of the fisheries of what is now Rocky Mountain National Park, from the historic distribution of fish in the area, to the history of fisheries management and the current cutthroat trout taxonomy situation. Chris has been a fish biologist with the United States Fish and Wildlife Service, working within Rocky Mountain National Park, since 1997. He has also worked at the U.S Air Force Academy, Fort Carson, Rocky Flatts, and Peterson Air Force Base. He has an avid interest in the history of fish in Colorado in general and in Rocky Mountain National Park in particular. In fact, he recently conducted a very successful and well-attended seminar for the Rocky Mountain National Park Conservancy on the history of fish in RMNP. As many RMF-TU members are aware, Chris is also coauthor of a recent and influential research article on the history, identity and current location of the Greenback Cutthroat Trout, Colorado’s state fish. Rocky Mountain Flycasters has teamed with Wildlands Restoration Volunteers in an effort to mitigate and restore our local watershed from the devastation of recent fires and floods. WRV has one last project this season on Sunday October 26, 2014 and we invite you to join with us in this important continuing project. See WLRV project list and register using the red “Register for this Project” in the upper right. This single day project in the High Park burn area will focus on revegetation and erosion control to preserve water quality within the scenic Cache La Poudre watershed. Volunteers will install log erosion barriers, remove invasive/noxious species, spread native seed and straw/mulch ground cover to restore ecological function to high-severity burned areas. 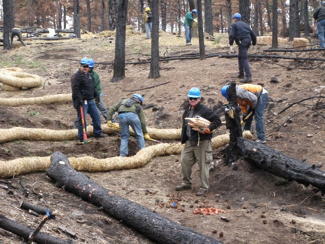 WLRV is hoping to bring together thirty volunteers for this last-of-the-season effort.